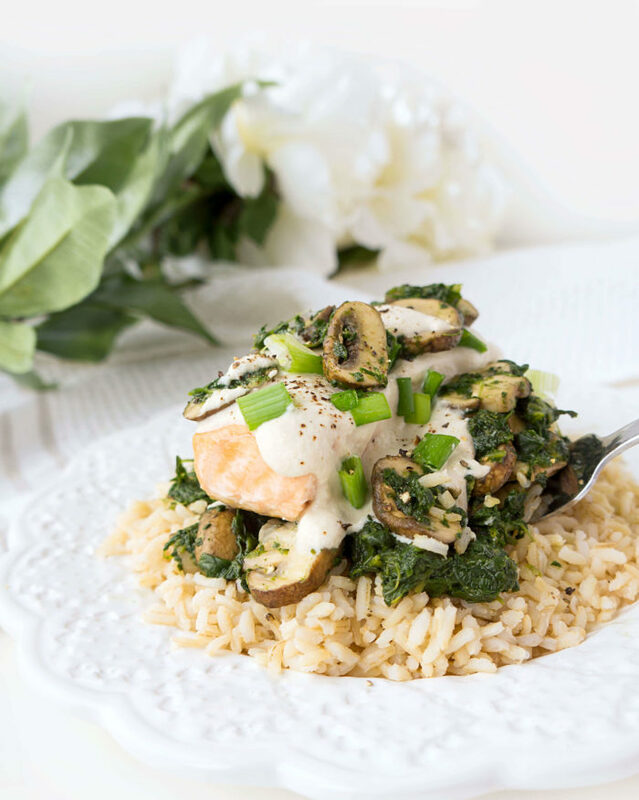 Growing up, my mom used to always make this creamy salmon florentine dish with spinach and mushrooms served along with some brown rice, quinoa or pasta. It was one of the meals I ALWAYS looked forward to eating for dinner back when I lived at home. As you might already know from my Mediterranean Salmon and Walnut Crusted Salmon posts, salmon is one of my favourite go-to meals both at home AND when we go out for dinner. But if I had a choice between a plain ol’ piece of salmon served with a squirt of lemon juice or a fancier salmon with delicious flavours and toppings, I’d choose the fancy salmon every single time. 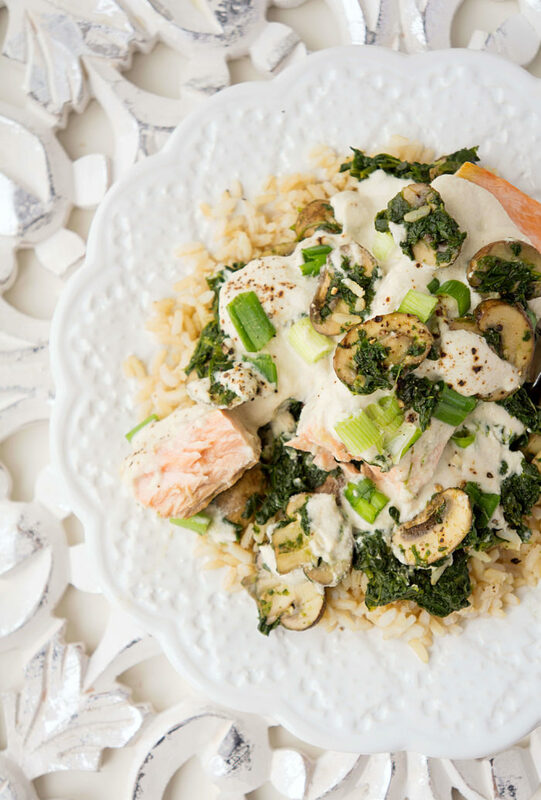 And really, how much fancier can you get than serving a piece of salmon on a bed of spinach and mushrooms topped with a rich and creamy sauce? That is one jazzed up piece of salmon. 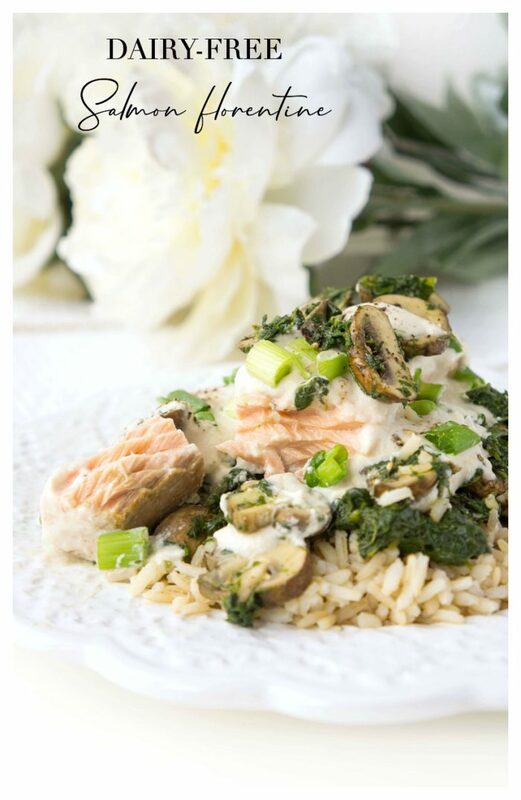 Now, a couple of months ago, I got a craving for this creamy salmon florentine dish. I hadn’t had it in years, and out of the blue, I decided it was time for this meal to make a reappearance. I didn’t have the recipe on hand, so I decided to create my own version of this meal with a dairy-free cream sauce. The version my mom used to make called for butter, flour and milk as the base for the cream sauce, but I had the perfect alternative in mind. A cashew garlic cream sauce. I swear cashews are the solution for EVERYTHING. Need a dairy-free cheesecake? Use cashews. Need to make a vegan caesar salad dressing? Use cashews. Need to make a rich and creamy, yet still healthy sauce? Use cashews. All that I ask is that you soak the cashews in advance so that when you blend them up with the water, garlic and salt, you get a creamy sauce and not a chunky one. That’s my little secret for a velvety smooth cream sauce every time. 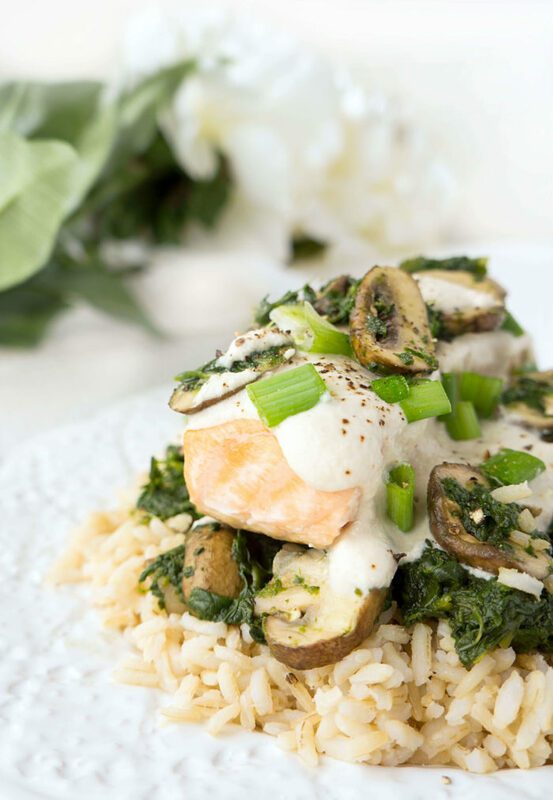 Better yet, you can make the majority of this meal in advance by baking the salmon, sautéing the mushrooms and spinach and whipping up a batch of the cream sauce and then simply assemble in a baking dish and pop it in the oven to warm it up before serving. 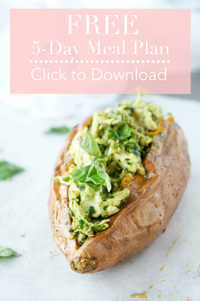 That’s one thing I love about this meal is that it’s fancy enough to serve for guests, but easy enough to make on those busy weeknights, especially if you’ve done some of the prepping in advance. It’s also boasting of those heart healthy omega-3s, monounsaturated fats, protein, vitamin K, vitamin A and potassium. While most cream-based dishes are a heart attack on a plate, this dish is actually incredibly good for the heart, since those healthy fats can help to lower cholesterol and the potassium can keep that blood pressure at bay. For the spinach, I recommend using frozen spinach cubes, (which you can usually find in the frozen vegetable section at the grocery store) and simply defrost them. I find they go a lot farther than using the fresh baby spinach since the fresh stuff shrinks so much when it cooks down, which means you need A LOT of spinach. If you don’t have access to the frozen spinach cubes, fresh is perfectly fine. As I said, I just find the frozen nuggets are a huge time saver and go farther. Either way, you’ll want to squeeze out that spinach really well once cooked to get rid of the excess water. As mentioned above, for ultra creamy cream sauce, soak the cashews for at least 2 hours in water. I usually like to do this overnight, so it’s ready to go the next day when I want to make the recipe. To blend the cashews into a sauce, unfortunately I’ve found that a food processor doesn’t work that well since it still leaves chunks behind. For best results, use a really powerful blender or magic bullet so that it blends the mixture into a really smooth sauce. 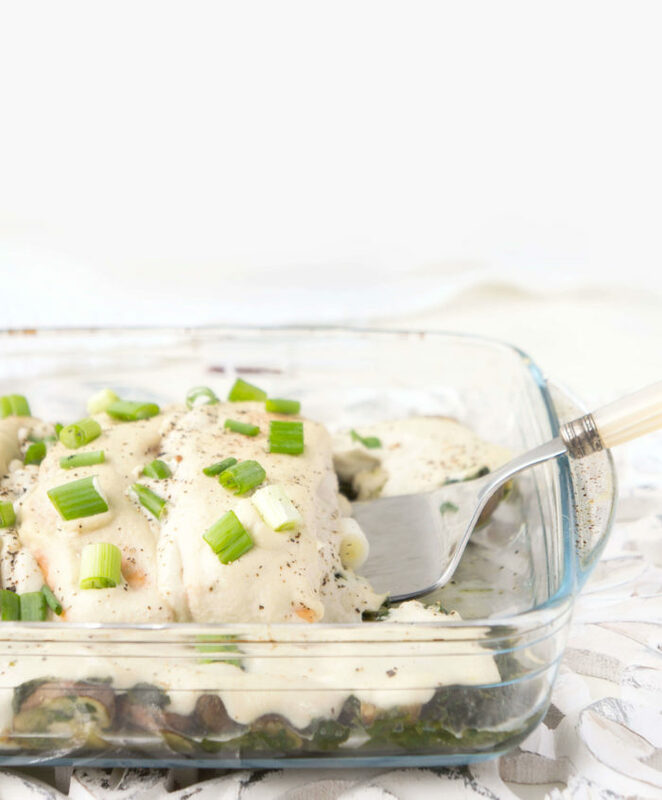 All in all, whether making this dairy-free salmon florentine for guests, your significant other or for a family dinner, this comforting, yet healthy meal will not disappoint! Place cashews in a bowl and soak in water for at least 2 hours or overnight. Place salmon fillets on parchment paper-lined baking sheet and squeeze lemon juice over the fillets along with a sprinkle of salt and pepper. Bake salmon for 20 minutes or until it flakes. If it has skin, gently remove skin from each fillet. Meanwhile, in a powerful blender or magic bullet, combine cashew cream sauce ingredients until smooth. Heat olive oil in skillet over medium heat. Sauté spinach and mushrooms until mushrooms are lightly browned and spinach has wilted, about 8-10 minutes. Drain any excess water from the pan. Spray a 9x13 inch casserole dish with cooking spray. Evenly distribute spinach and mushrooms across the bottom of the dish. On top of the vegetables, distribute the salmon fillets. 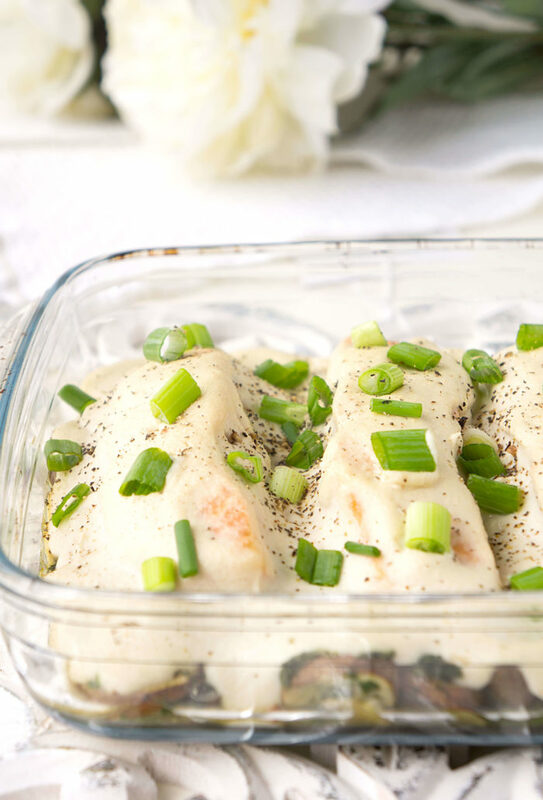 Pour the cashew cream sauce evenly over the salmon fillets. Bake for 20 minutes. 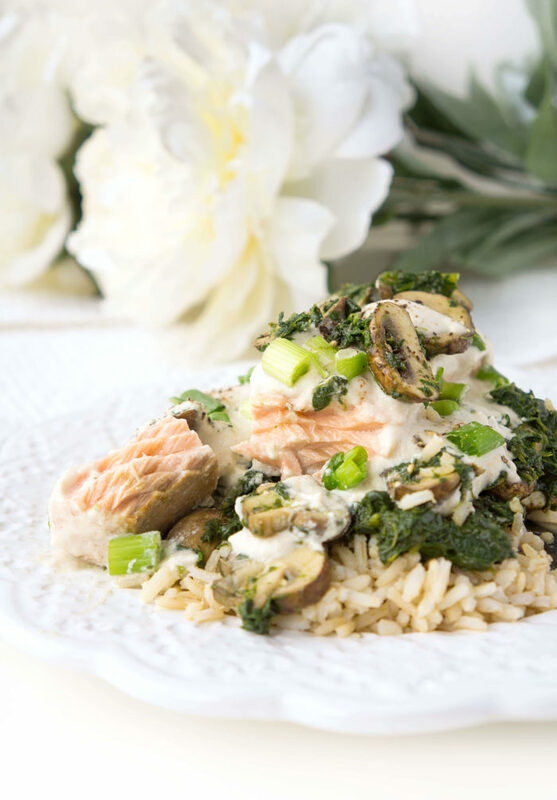 Serve the salmon florentine over brown rice, quinoa or whole-grain pasta or couscous and garnish with chopped green onion.